#55 Eli Hill, 4th year Senior starter for Renton High School. I love me some football. So doing a portrait session with high school Senior Eli Hill who plays football for Renton Senior High School was an absolute blast. However the shoot didn't quite start out as planned. A key part of doing on location portrait sessions is location scouting. This particular shoot was to take place at a location that should have been open. I checked the schedule early that week to make sure that no games were scheduled. As I am heading to the location I get a text from Eli's mother Irene telling me there is a soccer game happening. CRAP! Now what? I need to find a new location asap and at the same time not upset the client. At the time I happened to be dropping my wife off to a class she was teaching and she suggested a location that was really close to where I was dropping her off. I notified Irene that I was going to swing by this other location real quick to see if it was free. I pull into the parking lot (fingers crossed) pulled up to the fence and looked out into the field, it was empty. I only saw one person walking around the track. I immediately sent a text to Irene, and asked if we could meet at this new location (only about 10 minutes away). I am sitting in my car with the engine running stressing and waiting for the response, after a couple minutes I get a text saying "We will meet you there". I let out a huge sigh of relief, turned off the engine and start hustling to get down to the field and get set up before the client gets there. As I am setting up I see Eli, Irene and Gil (Eli's dad) heading down the hill to meet me. I am still pulling out my gear and trying to set up my lights. Normally I am at location no less than 30 minutes prior, checking the backgrounds, angles and getting my basic camera settings set up before the client arrives. So now the pressure was a bit higher than normal, since I didn't have much time before they arrived. As they got closer I noticed Eli was not in full gear yet, so as he began to put on his shoulder pads, cleats and jersey, I quickly to advantage and used that time to finish setting up. Luckily we both got done about the same time, so I approached Eli and began talking to him about what he could expect from the shoot and let him know if he had any thoughts or ideas for shots he should feel free to speak up. This kid was almost like working with a professional model. Normally there is a lot of direction needed for posing but with Eli it was a breeze. I threw out a couple of basics to turn this way, lower your chin, face the light and that's about it, we were off to the races. Each time we set up for a new pose or change positions, I have to double check the background for anything distracting. I wanted to get as much as I could right as they say "in camera" so that I don't have to do a ton of removing items in Photoshop. This saves so much time when it comes to editing/post processing. Gil having a little fun and getting in some poses. One of the things I always do during my shoots is to keep things light. I crack jokes, poke fun at myself and try to get the kids to cut loose a bit. It's even better when the parents get involved. In this case, Eli's dad was getting into it and practicing his own football poses. This really helps them relax so they don't look so stiff and it lets out their true personality. When you let them goof off and play you end up with some really fun shots. We pretty much had the field to ourselves the first hour of the shoot but then an entire team of soccer players showed up and took over the place. They were running all over the place, with no concern about getting in our way running in front and behind my shots. They even pulled back the soccer goal we had moved out of the way to get some nice shots with the goal posts in the background. Complete disregard for our space. After stopping down the aperture and increasing power to my speedlight I achieved the dramatic sky I was going for. Finally I decided to ask one of the players walking to the field if they were using the whole field to play, he replied yes, but not until 7 pm. This gave us just over 30 minutes to get all of the shot list done. I gathered up the gear and moved to the other side of the field. Now the pressure was on. Sunset wasn't for about 45 minutes, so I would have to use some creativity to get that dramatic sunset look we all love for football portraits. I switched to the wide angle lens, raised my F-stop, cranked up the power on my flash, got low and grabbed as many poses as possible in the short amount of time we had left. As you can see I got what I was after. All in all, the session went very smooth and the shots came out amazing. It's always nice to work with someone that needs minimal direction, and handles himself as a true professional. If Eli is the same way on and off the field as he was during our shoot, he has a really bright future ahead of him. I look forward to watching this young man move on in life and see what he has to offer the world. So the other day I was scrolling through my Facebook timeline just as I normally do seeing post after post and picture after picture. I thought to myself you know there are some really cool locations and amazing moments that people capture, but they were taken with their phone. Now don't get me wrong this isn't a rant from a photographer chastising people for using their phones and Instagram filters to capture photos. This is about taking the photo you made, whether you used a DSLR, Point and Shoot or your camera phone and taking a bit of time to really make it shine. I think we have all fallen into the trap of wanting to share it immediately and not caring about what it really looks like. Trust me I do this myself and I understand, you are exited and you want people to feel the moment, but don't you think that if you just put in a bit more effort and did a little extra editing they would really feel what you felt when you were there? All of our cameras capture great pictures these days, they are pretty much fool proof, but does that mean you should be like every other fool? Below I took a photo that I captured a while back with my iPhone 4s, yes thats right I said 4s (don't laugh to hard) and spent about 15 min editing it. I won't say this is the worlds best photo, but I enjoyed the scene and it gave me a chance to show exactly what I am talking about. If you look at the before and after you will see what I am talking about. I brought out the colors, added clarity did a bit of dodging and burning and then to finish it off, removed some of the distracting elements like shadows, poles, trash cans and fire hydrant. Again this is just to give you an idea of what can be done even with a photo taken with a iPhone 4s. There are plenty of free photo editing applications out there, such as Picasa or even GIMP to name a couple. Again I am not trying to be preachy here, this is just something to think about the next time you take that long hike to the top of the mountain, to a waterfall, or Hawaiian vacation. Just pick out a few of your favorites and add a little something extra to it and make it pop. So I had the niece and nephew over last night and thought to myself "Hey maybe I should round up the kids and make some portraits". So I grabbed my gear and began setting things up. Softbox "check", Speedlight "check", 70-200 "check", location "DAMN". My condo is not very big at all and not laid out very photographer friendly, so I had to be a bit creative. I found a small corner in the back master bathroom area just in front of a door that leads to the balcony. I quickly setup the light and snapped a few picks. The lighting was kinda working but the background was not. I could see the door handle and also some robes we had hanging on the door. Okay so now what? Do I take everything down? (pain in the A**), or do I get even more creative? More creative of course, sometimes laziness forces us to be more creative. So I scrounged through the linen closet for something to hang up to cover the door and everything hanging on the door. Just my luck I came across an old shower curtain. It had some pretty neutral colors but with the bokeh I felt it would look pretty nice. So I hung it up grabbed one of my test subjects and fired off a few shots. Bam!! I liked what I was seeing. Okay now comes the really tough part, how to get the kids to stop playing long enough to make some portraits. Bribe them of course..haha. I ended up with about 30 minutes of actual cooperation time. For the minimal set up and time it ended up being quite the nice session and some really nice pictures. Sometimes you have to make due with what time and space you are given and make the best of it. So this selfie stick craze has gotten a bit out of hand. We are seeing them everywhere. It is getting so bad that they are being banned from public places, like restaurants, concerts, game stadiums and even amusement parks. On top of that they are extremely deadly. People are actually dying taking selfies, with and without a selfie stick. Selfie deaths have actually outnumbered shark attack deaths. Selfies have always been a thing, going as far back as self-portrait paintings, with or without second ear. Eventually leading into photographs, remember taking your first selfie with a Polaroid? I sure do. But when did the world become so obsessed with taking selfies? I mean people take them everywhere, in the strangest places, like the bathroom, bedroom, and while out with family eating dinner. There is no place that is protected from the "Selfers", yeah I made that word up just now. So I guess it was just a matter of time that new techniques and gadgets came along to help out with that oh so important shot of you in the bathroom of Macy's. That's what makes this latest gadget dubbed the HSS so amazing. You are probably saying to yourself "what could be more amazing than the selfie stick spoon" even more amazing than the Belfie Stick (look it up). Well sit back hold on to your chair because this will absolutely blow your mind. If you aren't sitting down and holding on to something, I am not responsible for any injuries incurred while reading this and walking. Also, if you have any hard or heavy objects in your hand please put it down; I do not want to hear about any heads injuries because you will slap your head after hearing about this crazy new Selfie stick. So what is it you ask? Well first let’s talk about how this idea even came to be. I was sitting at my computer one day and kept reading all these articles about people being hurt and dying from taking selfies, selfie sticks being banned, Russia launching a selfie guide and thought there has to be a better and safer way. I racked my brain for hours, days, weeks (okay maybe not weeks) and then like being hit by a 1984 Toyota, it came to me, "oh what a feeling". I came up with the concept for the HSS, also known as the Hired Selfie Stick or Human selfie stick. I kinda borrowed from the idea of when people in the distant past would actually hire what they called "photographers" to take pictures of them. I know right! What the hell were people thinking, they must have been nuts to hire someone to take high quality professional photographs. It's such an insane concept, that's exactly why designed the HSS, you have to be a little bit crazy to be innovative. I mean think of the guy in the meeting who had to explain launching unhappy birds into bricks with pigs on them. Right! Now you are with me aren't you? I have 100% faith that this will spread like wild fire. Once people see how amazing their selfies look using the HSS they will never turn back! This is such an amazing product that I am not even trademarking or copyrighting this. I want to share it with the world. It is pretty easy to get yours, just go to your search engine of choice and search for your local HSS, the best way to do this is to type in your city+photographer in the field . Even better would be your city+Portrait+photographer. I have already worked with all the top search engines to make the HSS available in your market. Just be aware that there are many different levels of the HSS, so please do your proper research and make sure you find the HSS that is best for you. Please remember only YOU can prevent selfie deaths. So this time around we have Dylan who is all about Basketball, B-ball or Hoops whatever you want to call it. This session was quite challenging for multiple reasons, starting with the location. It was partially covered causing odd shadows everywhere. Then you throw in the bright sun that decided to show up 5 minutes into the shoot, it was overcast prior, and the wind was causing all kinds of issues with my octabox (lighting). I am just really glad that Dylan was a great sport and played along with my crazy ideas and angles. In the end, even with all the difficulties the session went well and the shots came out amazing. Dylan now has something he can proudly show off and always remember. I can't wait to see these printed out. This time around I got to work with Devin, who is preparing to enter his first year of High School. He was an absolute pleasure to work with and took direction really well. We tried a few new things this time around and he was up for the challenge. He showed great poise and patience when we tried the same shot over and over from multiple angles. I also played around quite a bit with different lighting styles, using more and less ambient light to create a more dramatic effect and mood. I really wanted to capture his personality (he's a smiler) but at the same time give the impression that he takes the game serious. Devin sounds like he is very excited about starting high school. As he put it "I am nervous but super excited." If he continues to keep a good head on his shoulders I believe this kid has a bright future ahead of him. 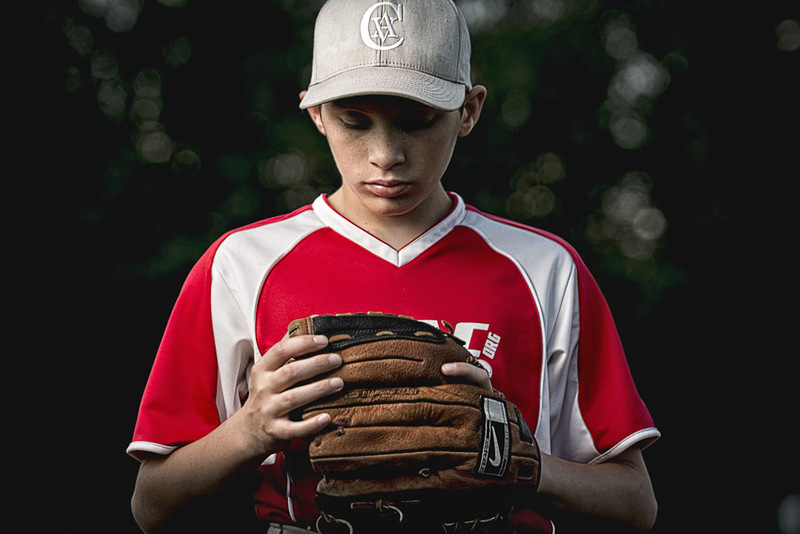 Just thought I would write up a quick post about my portrait session last week with 10 year old Mason at Petrovitsky Park in Renton. The theme for the shoot was Baseball as you can probably tell from the photos. It was extremely hot early in the day, but as the sun got lower, it turned out to be a perfect day for shooting (which here means it didn't rain). When Mason and his mother Trina showed up to the shoot, I could see that Mason was a bit nervous. So I quickly introduced myself, cracked a few jokes and got him to smile after that he began to relax. After about 10 minutes he started to really get into it and have fun. He was an absolute pleasure to work with and a great model. The photos came out great and now Mason has something he can be proud of and feel good about sharing and his mother can always look back on and smile. So I decided that I would pop open my photo collection and go back to check out some of my past work. I'm starting to think that wasn't such a good idea...LOL However the good part about it is that it really makes you see how far you have come. I mean my images weren't terrible or anything, it's just that the technique wasn't there. I see how I was much more of a point and shoot photographer back then, rather than actually "knowing" my gear and settings as well as I should have. The good thing is everyday I am learning something new and gaining another skill and will continue to get better and better with every picture that I make. Trying new things and experimenting is all part of the process. Sometimes I fail, but I always come out learning something new. It's okay to look back and your old work, don't be discouraged, you are getting better. As Timbuk 3 would say The future's so bright I gotta wear shades. So I leave you with this, learn your gear, try something different, experiment, think outside the box and just keep shooting. Finally the world gets to meet Anastasija. I had the distinct pleasure of working with her for the promotional photoshoot we did. When you meet her, at the time she was 11 you you can see the determination and strength in her eyes, but still has fun and the energy of a kid. I am so glad that everyone will not have a chance to know a bit more about this amazing young lady. Anastasija Fruehling became the youngest female yoga instructor in the United States at 11 years old. She persevered and worked very hard to realize her dream. It is amazing to learn that the youngest certified female yoga instructor in the US is only 12 years old. But this young lady has not achieved it merely by impulse, for she has taken time, effort and perseverance to make it to the top and for her skills to be finally recognized. Anastasija Fruehling may be a kid, but she became a certified yoga instructor while she was still 11 years old last summer, which is in its own right an amazing feat for a child this young. Her passion for yoga started from the free Sunday yoga classes in Ivivva at the local mall. Seeing the benefits of yoga as well as how enjoyable it is, she became inspired. This was then fueled by another inspiration, Jaysea DeVoe, the previous youngest female yoga instructor. This young yogini’s teacher’s dedication and passion for yoga became even stronger with all the stories of how Jaysea DeVoe came up. The newest female yoga instructor, Anastasija, made her way into what she is today through hard work and commitment to her craft. For that, she gave up her entire summer vacation in order to attend a yoga teacher training for 12 hours every day, including homework. She was taught by Danielle Zissou and did the training at Fruition Yoga. This young yoga teacher did encounter some struggles before she became as she is now. Before she was accepted to Fruition Yoga, she has been denied at all other local training programs because of her age and most them believed her dream of teaching yoga is impossible for a girl of her age. Evidently, something like that cannot stop her, as she persevered to become certified and was registered with the Yoga Alliance as a yoga teacher for completing the training program of 200 hours and then passed the exam before her 12th birthday even came. Ever since she passed the exam, she has been teaching yoga specializing with kids at Danielle’s yoga studio, and Lululemon as well as Ivivva on Sundays. For the whole week, this young yoga teacher is very much dedicated to yoga as well as Rhythmic Gymnastics as she spend over 25 hours each week practicing. As a result, she placed 2nd in the Regionals and 1st in State. She considers herself to be very innovative when it comes to yoga. This innovation is seen through her fun, hybrid-Hatha program that comes with an energetic twist to grab children’s attention, which is liked by adults as well. Right now, she is working on setting up her own regular program in a local studio which is going to be the first For Kids by Kids yoga program. She posts actively on her own business website Mulberry Yoga. Recently, she is also in talks with one of the major yoga clothing manufacturers to produce her own line of kids clothing for yoga. We finally got some decent non rainy weather here in Seattle, so I decided it would be the perfect chance to get out there and really test out the Tamron SP 70-200mm f2.8 DI VC. I grabbed my trusty Nikon d7100 threw on my trusty Black Rapid sport strap and then went for the big gun. First thing that I noticed was that this bad boy was heavy! It felt so solid and well built, I immediately started to smile. I told my daughter to put on her sneakers and we both headed off for the play park. Once we got there I played around with the zoom to kind of get a feel for it. The zoom was very smooth and not loose like my old nikon 55-200mm 3.5-5.6. The autofocus is fast, unless you're a pro sports photographer whose job depends on getting every shot, this lens's autofocus is plenty fast. The vibration control/reduction on this lens is amazing. When looking through the view finder it really snags the image and reduces nearly all camera shake. I had now issues at all with this lens. The hardest thing for me was getting used to the weight. Going from a almost all plastic 55-200mm, to this beast is a big jump. But man is it worth it. I highly recommend the Tamron SP 70-200mm f2.8 DI VC. I am so glad that I went with this over the Nikon 70-200mm f2.8 and saved myself well over $1000.